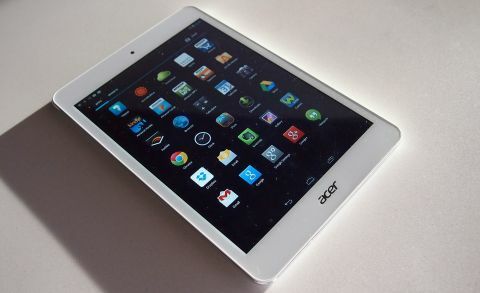 The Iconia A1, or to give it its full name, the A1-830 is a new version of Acer's original A1 Android tablet but still featuring Android 4.2.1 Jelly Bean - there's no word on when a newer version of the OS might be available for the device. The Iconia A1-830 release date is this month and it will be available for USD $149, with a cited Euro price of €169 (around GBP £141, AUD $256). While you might choose to compare this tablet to the Asus-made Google Nexus 7 and its competitors, this tablet is designed to slot in a little futher up the tree - it has a 7.9-inch IPS LED-backlit display and Acer also has the B1, which clocks in at 7-inches and is therefore a more natural competitor to the Nexus. The display has a 4:3 aspect ratio, but the resolution is disappointing at just 1,024 x 768. Even at this price point, your screen needs to compare to the competition. The big headline for the A1 is that it now features features one of Intel's last-gen Atom processors rather than an ARM Cortex-A9 derived chip. The first thing you'll notice when you pick the light 360g tablet up is that it looks quite like the 3G version of the white iPad mini. Imitation is the best form of flattery and, while there is visual similarity, there are only so many ways you can design a tablet casing from aluminum. As you can see, the standby and volume buttons are on the side here, while the camera is embedded in the white covering on the top. The rear-facing camera captures 1080p Full HD video recording with a 2,560 x 1920 resolution for stills. There's a front-facing camera, as you'd expect, with 720p resolution. As you can see, the design is pretty thin at just 8.5mm - almost the same as an iPad 2 and Nexus 7, but significantly thicker than the 7.2mm-thick iPad mini. The Acer Iconia A1-830 is powered by an Intel Atom (Clover Trail+) Z2560 1.6GHz processor, originally announced earlier last year. It isn't a very latest generation Bay Trail Atom, however though it's questionable whether you'd notice this in day-to-day performance on Android. We're looking forward to seeing the battery life stats - interestingly Acer cited a 7.5-hour battery life at launch, and it's clear that Intel Atom chips can't yet match their ARM-based equivalents on power frugality. There's 1GB of RAM on board, while internal memory is set at 16GB. There's a microSD slot for increasing this, though - support is included for memory cards up to 32GB. 802.11b/g/n Wi-Fi and Bluetooth 3.0 are also supported. Much as we'd expect then, but it's still a shame the chipset doesn't support the more power efficient Bluetooth 4.0. Acer has also introduced a batch of accessories to go with the new Iconia devices, including the 5.3mm-thick Crunch Keyboard, rechargeable via microUSB. The keyboard folds out and also serves as a tablet stand. The durable microfiber Crunch Cover also folds out into a stand with multiple angles – it's available in several different colours. The new A1 does look the part and, while its spec sheet is clearly designed to hit a precise price point, it's really great option if you want a device that has a 7.9 instead of a 7-inch display. It undercuts the iPad mini by some margin, though does seem a little limited in terms of raw specification compared to, say, the smaller Nexus 7. If you're not fussed about the screen resolution, we'd definitely recommend it.